La Jolla has beautiful beaches, great restaurants, and a plethora of shops, but there’s so much more. I hope this calendar of events will lead you off the beaten path to some of the activities that those of us who live here enjoy. Visitors are always welcome. From now until May 16 – The Museum of Contemporary Art San Diego (MCASD) in La Jollawill feature a new exhibit, Pleasure Point: Celebrating 25 Years of Contemporary Collectors. Organized by the museum, the exhibit celebrates the achievements of two groups of passionate collectors who support the MCASD, the Contemporary Collectors and the International Collectors, by showcasing major highlights of the museum acquisitions they have made possible during the past 25 years. Among the many works on view will be Tony Oursler’s confrontational video installation, Don’t Look at Me (1994); Doris Salcedo’s untitled, concrete-impregnated armoire (1995); Cornelia Parker’s scintillating Rorschach (Accidental IV) (2006), constructed from 70 crushed, silver-plated objects; and one of the most ambitious works ever acquired by the Museum, Nancy Rubins’ exuberant site-specific installation Pleasure Point (2006). April 3 to June 6 – “Grunion Groupies” meet at on Saturdays and Sundays, 11:30 a.m., 12:30 p.m. and 1:30 p.m. at the Birch Aquarium at Scripps to learn about the elusive California grunion, including how these fish “run” up our local beaches and lay their eggs in the moist sand. You can also join the Birch folks to witness an actual grunion run on the following dates: Friday, April 16, 9:30-11:30 p.m., Friday, May 14, 9:30-11:30 p.m., Friday, May 28, 9-11 p.m, and Saturday, May 29, 9:30-11:30 p.m. There’s more info in the February 14 post below. April 3 – Egg hunt at the La Jolla Recreation Center, 615 Prospect St., for children ages 2 ½ to12. http://www.sandiego.gov/park-and-recreation/centers/lajolla.shtml or call 858-552-1658. BYO basket. April 4 – Easter brunch? >See the March 17 post below for suggestions. By the way there’s no Farmer’s Market on Easter Sunday. April 19 to 21 – The San Diego Jewish Music Series will take place at the Lawrence Family Jewish Community Center. Performers include A. J. Croce, Broadway Extravaganza (the music of Jewish composers and lyricists), and Re-Vital, Israeli Performance Ensemble. 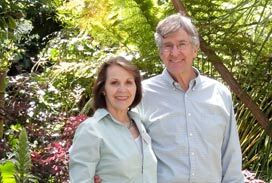 http://sdcjc.lfjcc.org/sdjmf/2010. Late April through summer – For a memorable evening, check the tide table on their website and book at table at the beachfront Marine Room Restaurant for one of their High Tide Dinners. While you dine, waves will roll up on the sand right in front of you and may even crash on the floor-to-ceiling windows. 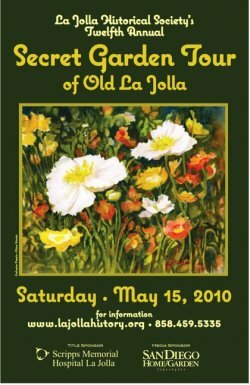 May 15 – The Secret Garden Tour of Old La Jolla, sponsored by the La Jolla Historical Society, is a once-a-year opportunity to go behind the high walls and gates that enclose some of our community’s loveliest homes. The locations of the gardens are kept secret until the day of the tour, but my sources tell me that this year one “jaw-dropping” property spans over 5 acres right on the ocean. May 19, June 16, July 21, August 18 & September 15 are the dates of the 4th Annual Green Flash Concert Series at the Birch Aquarium at Scripps – a unique summertime experience with live music and spectacular ocean sunsets. The concert series occurs on the aquarium’s stunning outdoor tide-pool plaza and offers a sophisticated mix of national performers. Green Flash Concerts take place from 6 to 9 p.m. and are for guests ages 21 years and older. June 26 & 27 – The 24th Annual La Jolla Festival of Arts and Food Fair, at the corner of Genesee and Regents Rd., hosts over 190 award-winning local and national artists displaying paintings, sculptures, fine jewelry, photography and more. Guests can enjoy a variety of cuisines in the festival food area, listen to live entertainment and visit the children’s area featuring interactive booths, hands-on games and activities. June & July – The Tony Award-winning La Jolla Playhouse will kick-off its season with the world premier of Surf Report, a comedic drama that follows a woman named Judith and her turbulent relationships with her nagging husband and distant daughter through her life’s story that examines the sacrifices we make, or avoid, for our families. In July & August, the Playhouse will present a rendition of A Midsummer Night’s Dream. This timeless classic of forbidden love will be re-imagined into a gravity-defying production where secret lovers find themselves in a world turned upside-down – literally. June 6 to September 19 – Here not There, at The Museum of Contemporary Art San Diego (MCASD) in La Jolla, will feature local San Diego visual artists and will focus on the variety, strength, and vitality of individual contemporary art practices. Here not There explores the broad range of media and techniques used by local artists including an alternative art section that ranges from painting to furniture design. Secret Garden poster courtesy La Jolla Historical Society. The look of your site is wonderful, let alone the content material! Fantastic weblog layout.